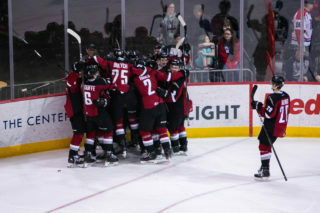 Saturday night at Prospera Place in Kelowna the Vancouver Giants (31-12-2-0) extended their season-long winning streak to eight thanks to a 2-1 victory over the Kelowna Rockets (19-24-3-1). 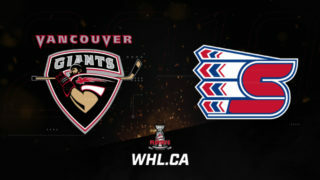 Bowen Byram broke up a 1-1 game with a power play goal at the 14-minute mark of the third period to help lift the Giants to their fourth straight victory against Kelowna this season. Dallas Hines had the other Giants goal which came early in the opening period. Nolan Foote had Kelowna’s lone tally which came 15 seconds into the second period. Between the pipes, Trent Miner stopped 18 Kelowna shots to earn his 15th win of the season while his counterpart Roman Basran made 37 saves for the Rockets. VAN – Dallas Hines made it 1-0 Vancouver at the 3:14 mark of the first when his shot from the left-wing point snuck through traffic and past Roman Basran. Evan Patrician had the lone helper on Hines’ sixth of the season. 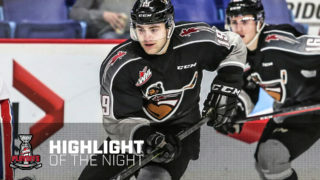 KEL – Nolan Foote tied the game just 15 seconds into the second period when he pounced on a loose puck in the slot and roofed his 25th of the season up and over Trent Miner’s shoulder. VAN – Bowen Byram restored the Giants lead at 14:00 on a power play. He took a pass from Tristen Nielsen, skated into the left-wing circle, toe-dragged the puck past a Rocket defender before rooming home his 17th goal of the season. Goaltender Trent Miner earned the second assist on Byram’s game-winner. Next Giants Game: A rematch with the Kelowna Rockets tomorrow night at the Langley Events Centre. Puck drops at 4:00 PM. In each of his past three victories, Giants goaltender Trent Miner has only surrendered one goal against. His goals-against-average currently sits at 1.82 which ties him for second in the WHL. He’s also on a two-game point streak having earned an assist in each of his past two games. The Giants have won four consecutive road games and improved their overall road record to 12-7-1-0. It’s also their third straight road victory in Kelowna. 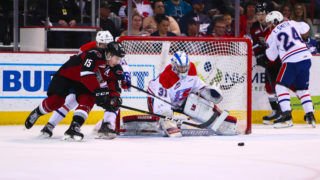 The Vancouver Giants have the best road power play percentage in the entire Western Hockey League (31 percent). The Giants went one-for-two on the power play on Saturday night. 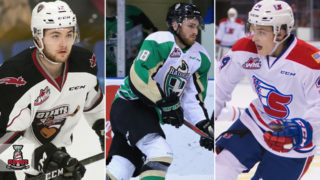 Both teams lost a forward due to injury on Saturday night: Dawson Holt (Giants) left the game in the second period after a collision with Rockets defenceman Lassi Thomson while Rockets forward Liam Kindree was helped off the ice in the first period after he collided with his own teammate Cayde Augustine.